Pipeline, storage and associated applications in Chile serve to illustrate Rotork's scope of supply for fluid power valve actuators in a range of different technologies to suit diverse and challenging environments. 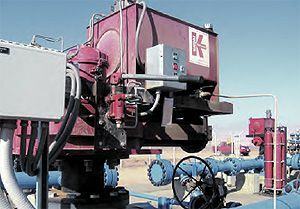 Customers required reliable, heavy duty pipeline valve actuators to provide routine operations and safety shutdown duties. Applications included cryogenic valves in challenging environments ranging from saline coastal locations to arid desert areas with extreme temperature fluctuations. In remote locations the lack of conventional power supplies dictated the requirement for renewable energy sources such as solar power. Rotork fluid power valve actuators have been installed throughout a major new LNG (Liquefied Natural Gas) importing and distribution project that is expected to meet 40% of the demand for gas in Chile and secure energy independence for the country. The LNG complex at Quintero Bay encompasses the installation of a sea terminal to receive LNG from tankers and a plant for regassifying and distribution by pipelines into central Chile. Rotork Fluid Systems has received orders for heavy duty, scotch-yoke pneumatic, gas-over-oil and high pressure gas actuators which have been supplied to valvemakers in France, Italy and Spain. The majority of the eighty-seven CP and GP range pneumatic actuators supplied are operating cryogenic service ball and butterfly valves at the Quintero Bay marine terminal and the adjacent storage and regassification plant. 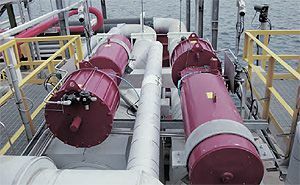 The exposed marine environment has dictated the use of carefully selected corrosion resistant materials in the packaged control systems and components supplied with these actuators. The GO range gas-over-oil and HPG range high pressure gas actuators have been supplied for a new 28 kilometre pipeline which links the Quintero LNG complex to the Electrogas terminal at Quillota for integration with the existing gas network and fuelling combined cycle power plants operated by Endesa Chile. The GO unit is installed on a Class 600 24inch ball valve at the City Gate in the Quintero LNG terminal, whilst the HPGs are installed on Class 600 eight inch and Class 300 twelve inch ball valves at the Electrogas Plant Gate in Quillota. Designed for safety and shutdown duties, GO and HPG actuators use the pipeline gas as the motive power source. Valve operating speed is adjustable in both directions and manual hydraulic override is provided as standard. All the Rotork actuators supplied are certified to ATEX 94/9/EC and IP66M/67M in accordance with PED 93/27/EC. The Quintero Bay terminal will have an annual supply capacity of 2.5 million tons of LNG. The $1.2 billion project is owned by GNL Quintero SA, a joint venture between electricity generator EndesaChile (20%), the state oil company ENAP (20%), gas distributor Metrogas (20%) and the British Gas Group plc (40%). 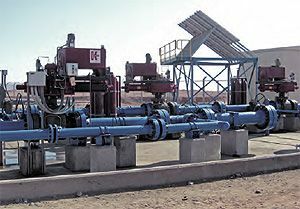 In the Chilean mining industry, Rotork Skilmatic EH electro-hydraulic valve actuators have provided a successful solution for the provision of reliable emergency valve operation on a slurry pipeline in one of the world's most arid, inhospitable and remote locations. The Atacama Desert in north-east Chile is traversed by an eighty kilometre pipeline owned by the mining company Compañia Minera del Pacifico SA. The procurement and construction contractor for the project is Constructora Belfi and the engineering contractor is Brass. The pipeline carries iron slurry from the town of Copiapo to the port of Caldera, from where it is exported. The Rotork actuators have been installed at the UVS-1 emergency plant centre, half way along the pipeline and in the middle of the Atacama Desert. Here, the annual rainfall is a meagre 12mm and the ambient temperature fluctuates between -15°C in winter and +40°C in summer. Three Skilmatic EH electro-hydraulic actuators have been installed to operate ANSI Class 1500 ten inch ball valves. 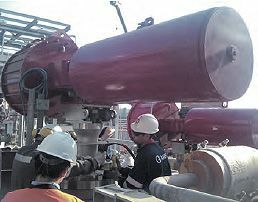 The actuators provide double-acting on-off control for the valves, under remote SCADA system supervision. The innovative Rotork Skilmatic EH design comprises an integrated control module, a hydraulic manifold and a power unit consisting of a motor, hydraulic pump and reservoir. Protected by a waterproof, dustproof and explosionproof enclosure, the actuators' electronic functionality benefits from Rotork's IQ intelligent electric actuation technology, providing configuration, diagnostics, fault indication and position indication by means of a digital visual display and non-intrusive, two-way communication with a hand-held programmer. The self-contained actuators operate from a 24 Volt DC supply, enabling an efficient, economic and environmentally friendly solar powered battery system to be used. 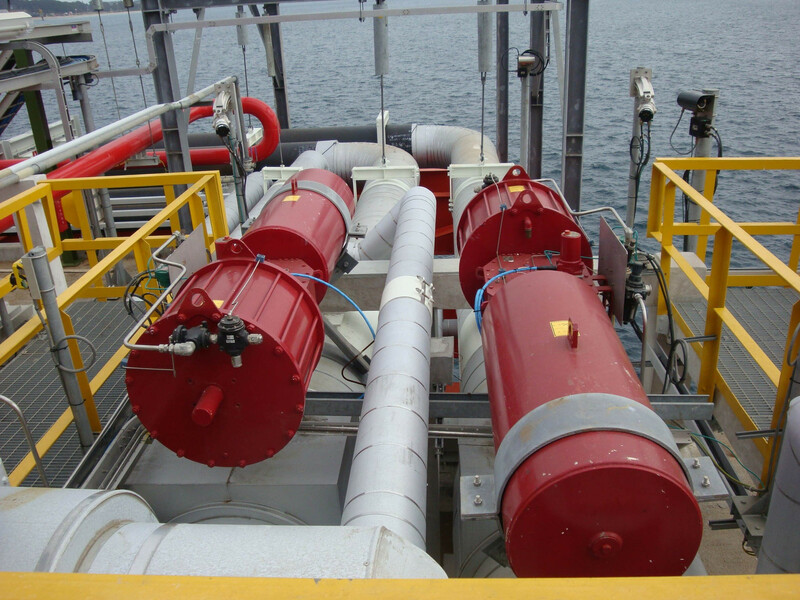 The security of emergency operation is further enhanced at this site by back-up nitrogen tanks which enable each actuator to perform three valve strokes. In addition to a comprehensive product range, Rotork's global organisation - supported by local representation in the form of sales and engineering participation Chilean agent Ineco, S.p.A - has been a key factor in the company's success with these important projects. For the Quintero Bay terminal and pipeline Rotork's activity was co-ordinated at Rotork's USA head office in Rochester and involved Rotork offices in France, Italy, Spain and the UK, where the engineering, procurement and construction contractor CB & I is headquartered. Regarding the Atacama Desert project, Gabriel De Visnyey, Rotork Fluid Systems Regional Sales Manager for Latin America, explains: "This project is one of a number of remote pipeline applications which have recently adopted the Rotork Skilmatic EH solution. The features inherent in the electro-hydraulic design are ideal for remote installations and facilitate the use of renewable energy sources such as solar power whenever possible". These actuators were also sold by Rotork's Chilean representative Ineco S.p.A., who are providing local support.